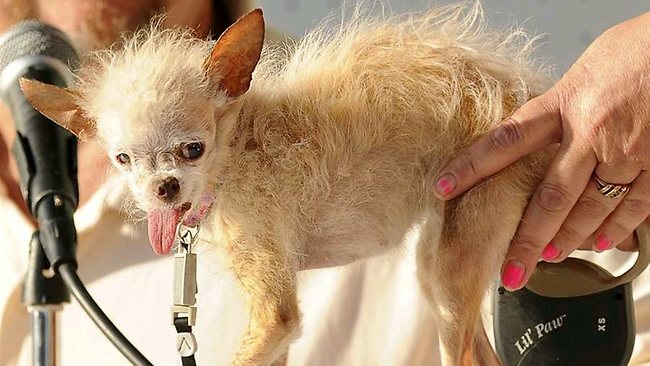 YODA’S short tufts of hair, protruding tongue, and long, seemingly hairless legs were enough to earn it the World’s Ugliest Dog title at a Northern California fair. The 14-year-old Chinese crested and Chihuahua mix won the honour this week at the 23rd annual contest at the Sonoma Marin Fair. Owner Terry Schumacher of Hanford, California,, said the dog had come a long way since she was found abandoned behind an apartment building. She said when she first found it she thought the dog was a rat. Yoda’s distinction comes a year after a one-eyed Chihuahua named Princess Abby claimed victory. No matter how ugly it is, u shouldn’t abandon it. That is a seriously freaky dog!